Tribal Systems was asked to create the Vision Air portal for Veolia Water Technologies. Veolia wanted to use the latest technology that the internet makes possible to create a better experience for its customers in the countries across Europe. It wanted to give it customers instant access to their service scheduled, service reports, documentation, orders, contract coverage, and live feeds of data from their Veolia equipment, all while putting Veolia's support support team just a click away. Experienced in industrial IoT solutions, Tribal's consultancy team devised together a solution which included the development of an online customer portal, integration with Veolia's ERP systems, and 24/7 connected water treatment systems through Sierra Wireless® AirVantage IoT infrastructure. Veolia supply water treatment equipment and services to a range of industries. It serves customers in the pharmaceutical industry, food and beverage, chemical processing, power, research and healthcare. Customers in these industries rely on water treatment to keep their businesses operating efficiently, as any decline in the quality of water in those processes means increased cost. 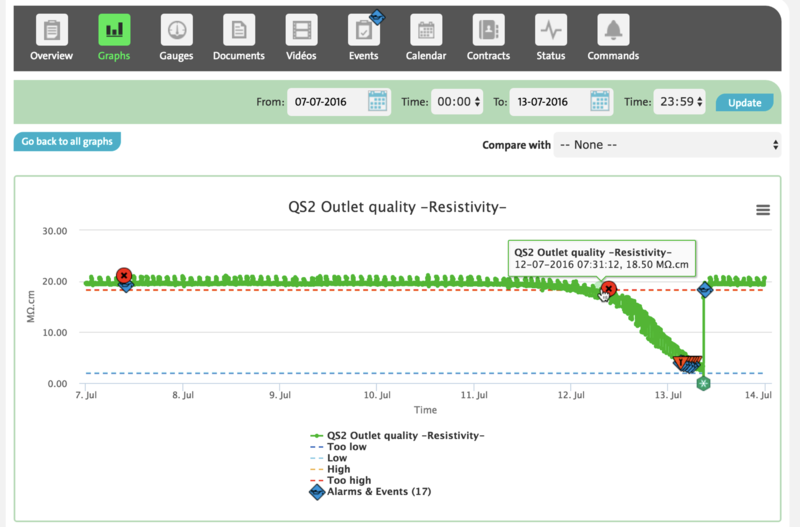 The solution to this challenge needed to encompass giving customers a clear view of upcoming service visits on their equipment, and up to the minute data on the performance of equipment so that interventions could be planned and problems dealt with quickly. For our consulting team there were some key components that needed to be brought together. For the human interface of the portal, we deployed our IoT customer portal platform based on Assetwolf. This allowed us to create a user-friendly portal design in the Veolia brand. Drawing on the skills of our in-house design team, we created an intuitive interface, which included a dashboard and a set of key information pages. The Vision dashboard can be personalised to the user's needs and key tasks, giving quick access to information and controls. Beside the web-based interface, the system has the capability of sending emails to customers to keep them informed. It can alert them to live equipment problems, inform them when contracts need to be renewed, and advise when new documentation is available. There is a sophisticated access control system which ensures the right people see the right data. Customers' accounts are not just linked to the locations where they work, but the portal also determined what kind of information they can see at each. For example, certain personnel should only be permitted to access service-related information, while others should be allowed to see deeper technical information about equipment. 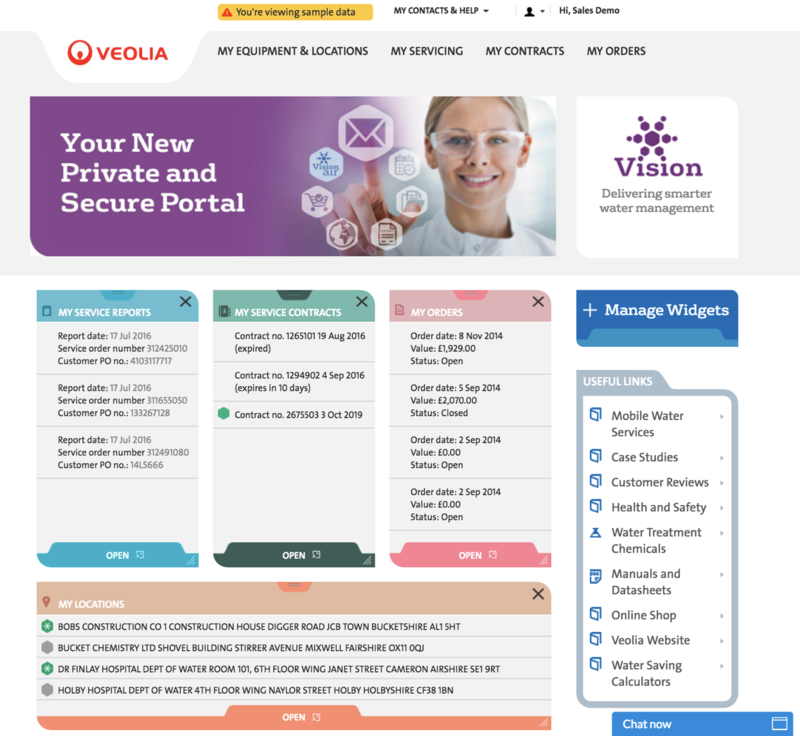 To bring up-to-date service information to the fingertips of Veolia's customers, Tribal provided an integrated solution which connected the Vision portal with Veolia's in-house ERP system. 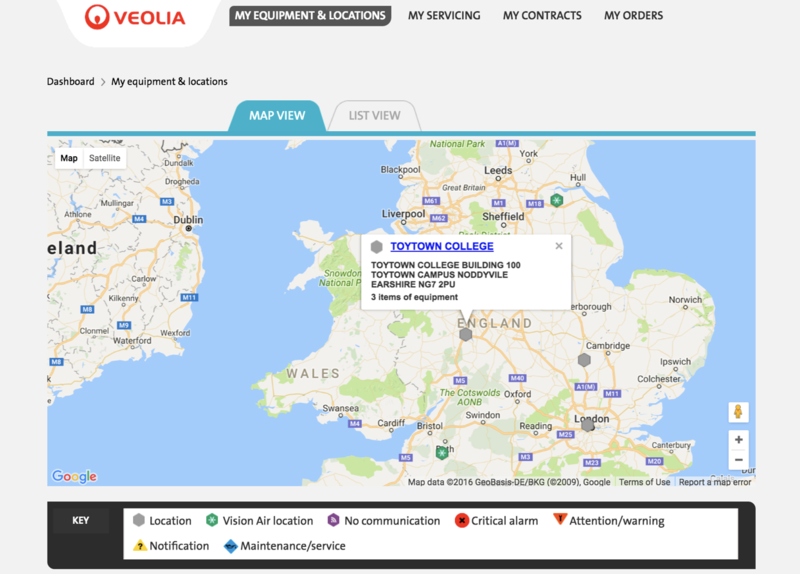 This allowed each customer to see their planned visits by Veolia service engineers on the Vision portal. Where a customer needs to make changes, or request an emergency visit, we created the means to do this via the portal. Service reports are also available, so that within minutes of a Veolia engineer's visit, the report is available to the customer via the portal. Detailed, live data is available, the greatest benefit being remote diagnosis and preventative maintenance of problems. For example, where water quality is following a predictable decline, it can indicate that a consumable needs to be changed. Remote control is enabled too, and Veolia's engineers can send commands via the portal to customers' equipment. The communications was achieved using Sierra Wireless's hardware for connectivity, and their AirVantage enterprise IoT platform to aggregate and store incoming data. By using cellular-based communications, it gave Veolia a common stack to deploy with, avoid local issues of wireless or wired access. The cloud-based AirVantage platform created the means to roll out the Vision Air portal globally, irrespective of global reach or volume of data. Veolia’s new Vision Air service lets customers access a fully managed service for maintenance, reporting, and analysis of their water purification systems. Driven by a combination of logistical, contractual and real-time data, customers can minimize equipment down-time and maximise benefits of their Veolia systems. The VisionAir platform is built on real-time encrypted performance data, including alarms and equipment status. This makes it possible to track important metrics, like flow, pressure, temperature and conductivity, in each water treatment system. By analyzing real-time usage data captured by the Vision Air platform, Veolia can make better decisions about the service and consumable requirements of their water treatment systems. Veolia’s customers have access to the data, so their own technicians can monitor their systems, even from a remote location. The initial rollout of Vision Air was in the UK and France, but was quickly followed by other European countries. Tribal's Assetwolf cloud-based architecture allows the system to be scaled out globally, providing essential types of commonality to the system yet permitting country-based localisations, such as translation into local language and other adjustments to suit Veolia's customers in each country. Industrial, Healthcare, Research and Pharmaceutical industries rely on Veolia Water Technologies to supply high quality water treatment systems and ongoing service and support. Veolia wanted to provide even higher levels of service, by opening a wide range of information to their customers, and connecting their water treatment systems to the Internet of Things. Once connected Veolia, was able to offer enhanced services such as round the clock monitoring, predictive maintenance and advanced data analytics.